There are two days left to propose a session for the American Association for State and Local History Conference to be held in St. Paul, September 17-20, 2014. Don't miss out on the biggest history meeting in Minnesota history. The Jolly Green Giant, from Blue Earth MN, takes the stage at the Fitzgerald Theater in downtown St. Paul to lend his talents to "A Prairie Home Companion." Ho, ho, ho! Pass the Powdermilk Biscuits! Have you wanted to help the history community decide how Legacy grant dollars should be spent? Consider applying to serve on the Historic Resources Advisory Committee. Short periods of intensive reading and effort required. See page 484 of the State Register for more information. Nomination packages due this Friday November 15, 2013. The Historic Resources Advisory Committee held its disbursement meeting for FY 2014 last Thursday and Friday. There were 81 applications considered, which requested $8.2 million of the $3.6 million available. Next step is for approval of the recommendations by the MNHS Council in December. The meeting was historic in the sense that it was the final meeting with original members of the committee. The history field thanks departing members Mark Peterson (chair), Tamara Edevold, Ram Gada, Bill Latady, and Ben Vander Kooi, Jr. for their commitment and dedication to Minnesota history. History village battles with FEMA. Geldner Sawmill in Le Sueur County to be focus of a documentary. Have you set up your Give to the Max account yet? Here's a good reason why you should. What do you charge for speaking engagements? Stevens County Historical Society, Morris MN, seeks part-time Office Technology Specialist. Call Ward, 320-334-2079, or Randee, 320-589-1719, for details. Deadline: November 29, 2013. Hamline-Midway History Corps, St. Paul MN, meets Saturday November 16, 2013, 2-4 p.m., Ginkgo Coffeehouse. The topic will be researching history using Google maps. In anticipation of the 150th anniversary of the Gettysburg Address, join Minnesota Historical Society and tpt for a one-hour premiere of "Minnesota and the Civil War Showcase," Sunday November 17, 2013, 3 p.m., Minnesota History Center, St. Paul. Kandiyohi County Historical Society, Willmar MN, announces the opening of Festive Forest, Christmas trees decorated by local organizations. Trees are on view December 1-29, 2013; Monday-Friday, 9 a.m. to 5 p.m. and Sundays, 2-5 p.m. Museum will be closed Christmas Eve and Christmas Day. Call 320-235-1881 for more information. Kandiyohi County Historical Society, Willmar MN, announces that Christmas at the Sperry House will take place December 1, 8, 15, 22, and 29, 2013, 2-5 p.m. or by appointment. Call 320-235-1881 for more information. Veterans' Memorial Hall, a program of the St. Louis County Historical Society, Duluth MN, invites the public to the annual Veterans Remembrance Dinner, Thursday December 5, 2013, 5-8 p.m. Celebrate the grand opening of the Albert J. Amatuzio Research Center. Tickets: $35; purchase at Veterans' Memorial Hall or call 218-733-7500. Waseca County Historical Society, Waseca MN, presents "Visions of Sugar Plums," a holiday exhibit of Christmas vignettes--both full-size and in miniature, December 7-8, 2013, 11 a.m. to 5 p.m. Contact WCHS, 507-835-7700, for more information. Sacred Heart Area Historical Society, Sacred Heart MN, celebrates Santa Day, Saturday December 14, 2013, 9 a.m. to 12:30 p.m., Sacred Heart School and Sacred Heart Area Museum. Lots of family-friendly activities! National Council on Public History has made their 2014 Annual Meeting brochure available online. Join them in Monterey CA, March 19-22, 2014. Registration now open. Minnesota Historical Society announces that Ben Leonard, executive director of the Nicollet County Historical Society, has been hired as the new Manager of Community Outreach & Partnerships in Historic Sites, beginning December 16, 2013. He will split his time among St. Peter MN, the History Center in St. Paul MN, and the statewide network of MNHS historic sites. He will collaborate with David Grabitske in the Historic Preservation Department, among others who interface with the Minnesota history community. Minnesota Digital Library has added new content to its Press Room to make it easier for Minnesota Reflections contributors, media organizations, and other interested parties to communicate information about MDL and stay informed about the work they do. Goodhue County Historical Society, Red Wing MN, has launched a new website with a simplified address, a new look, and expanded options to interact with the Society. National Endowment for the Humanities announces that applications are now being accepted for Collaborative Research Grants. Deadline: January 7, 2014. Stearns History Museum, St. Cloud MN, held a press conference on November 12, 2013 announcing a new partnership with the Smithsonian Institution in Washington D.C., through the Smithsonian Affiliates program. Stearns History Museum is the only Smithsonian Affiliate in the State of Minnesota. 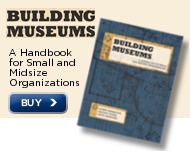 Creativity in Museum Practice, by Linda Norris and Rainey Tisdale. Published by Left Coast Press.